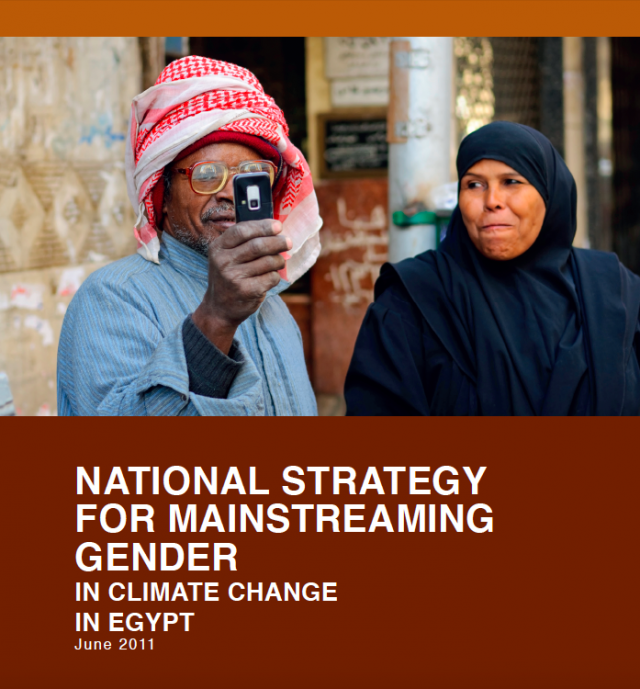 The National Strategy for Mainstreaming Gender in Climate Change in Egypt is the result of a series of inputs –interviews with policy makers, stakeholder consultation and research, among others. We would like to express our sincere thanks to them for their advices and to their institutions for supporting their participation. National workshop with representatives from the Egyptian Environmental Affairs Agency (EEAA), women organizations, Ministries of Water Resources and Irrigation, -Agriculture and Land Reclamation, the League of Arab States, the United Nations Development Program (UNDP), USAID, Global Environmental Facility (GEF), League of Arab State, academic and research institutions, media, civil society, NGOs and CEDARE, held from the 17th to the 19th of May in Cairo, Egypt. We thank all these governmental institutions and individuals for their commitment and dedication in producing this national strategy. Acknowledgements are also to the task force group of UNDP, EEAA, and gender experts who have collaboration and commented on various sectors to finalize the National Strategy for Mainstreaming Gender in Climate Change in Egypt. A special word of thanks go to Dr.Mawaheb Abou El-Azm, Chief Executive Officer of the EEAA for her exceptional commitment to promote the mainstreaming process and adapting the strategy to the Egypt Third national Communication. Last but not least we acknowledge the commitment and support of CEDARE for their coordination and support to facilitate conducting national consultation for the Egypt strategy. The development of this Strategy was made possible largely due to the generous financial support from the Government of Finland.